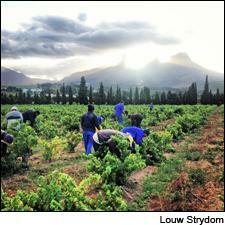 Workers pick grapes at Ken Forrester Vineyards in Stellenbosch. Ready to taste the first wines of 2013? While vines are just flowering in Europe and North America, the Southern Hemisphere has picked, crushed and fermented this year's crop. South African grapegrowers enjoyed a wet winter, meaning healthy yields, followed by a dry, warm summer. But rain during harvest made picking anxious at times. Here's a sneak peek at the upcoming vintage. Check out Wednesday's report on Australia and New Zealand and Thursday's on Argentina and Chile. In the Swartland district, the qualitative epicenter for Rhône varieties, producers noted that early heat was balanced by a late spate of rain. “The weather was quite different from the last five vintages,” said Adi Badenhorst, owner and winemaker at A.A. Badenhorst Family in the Swartland. “Good winter rains led to even budding and vigorous growth, so a larger crop but less need for green harvesting. The summer was drier and this put the vines in some stress, but we were happy to have the heat early and then a bit of rain in February which really helped the old Cinsault and Grenache vines. Overall, reds are outstanding I think." Sorting through Syrah at Stark-Condé in Stellenbosch.